There are many apples to choose from this time of year and it is hard to know which are the best for pies, eating, salads, baking and yes, applesauce. I started canning applesauce so I could have that fresh taste long after the apples I like are no longer available. You can use just one type of apple or you can mix a few varieties together for a unique flavor. I do both, my favorite applesauce apple is the Jonagold. Jonagold is a cross between a Golden Delicious apple and a Jonathan apple. It is juicy and has a sweet-tart taste to it, making it a great apple all by itself for a batch of applesauce. The applesauce is a nice golden color (left jar above). If you like an applesauce that is a nice white color McIntosh apples are the way to go. They have a shiny red and green skin with a beautiful white flesh. They are more on the tart side so a little more sugar may be needed. But this will give you the whitest applesauce (middle jar above). 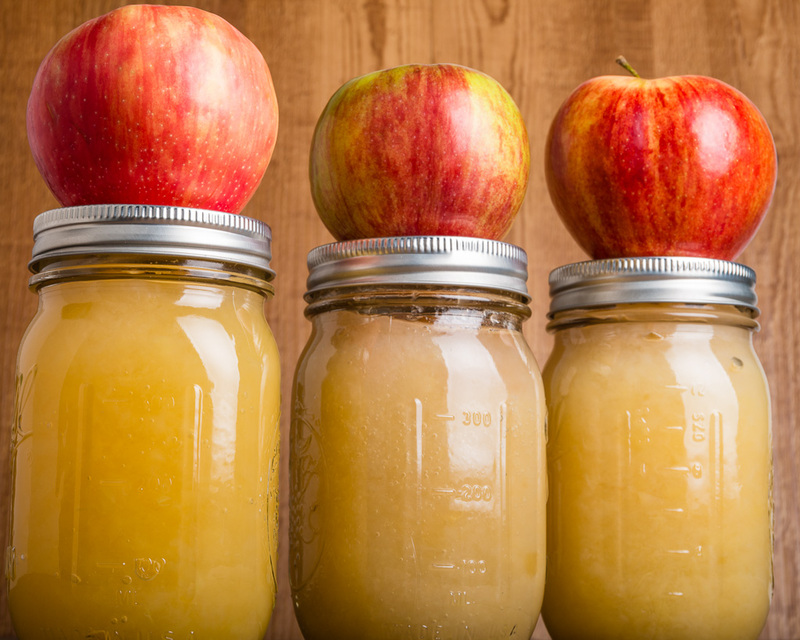 My favorite applesauce combines three different apples together, the Jonagold, McIntosh and Honeycrisp apples. The Honeycrisp has become one of the most popular eating apples these days. It is a firm apple so it will keep well and it has a sweet and tart taste. So combining all three you have all the best parts of these apples in one full of flavor applesauce. Now is the best time of the year to can your applesauce so you can have that Fresh From Oregon taste all year long. Place apples in a large pot with the water and lemon juice. Bring to a boil or medium heat, reduce heat to a simmer and cover with a lid for about 15-20 minutes or until soft. Stir about every 5 minutes so your applesauce does not burn. Add more water 1/4 cup if it looks too thick and it’s sticking to the bottom of the pot. Once the apples are soft use a masher to break up the apples into smaller pieces. I like my applesauce more on the chunkier side. If your family likes a smoother applesauce you can run it through a food mill or food processor. Add the sugar and mix until sugar is dissolved. You can add some cinnamon at this time depending on your taste. I prefer to add my cinnamon to my applesauce once I open the jar to serve**. To process applesauce have your pint jars nice and hot (about 10 minutes before applesauce is ready I run my jars on the quick cycle, 7 minutes, on my dishwasher and leave them until I am ready to use). Have a water bath canner ready and boiling. Pour finished hot applesauce into jars leaving a 1/2″ headspace. Wipe the rim of the jar, add lid and ring and hand tighten. Add to the boiling water bath canner and process for 20 minutes once the water returns to a boil. Remove and let set for 24 hours. Check to make sure all the lids have sealed and they are ready to store. ** To serve applesauce: open and pour into a bowl. You can serve cold or I like to put it into the microwave for 30 seconds, stir and heat another 30 seconds. Sprinkle with some cinnamon and it is ready to serve! 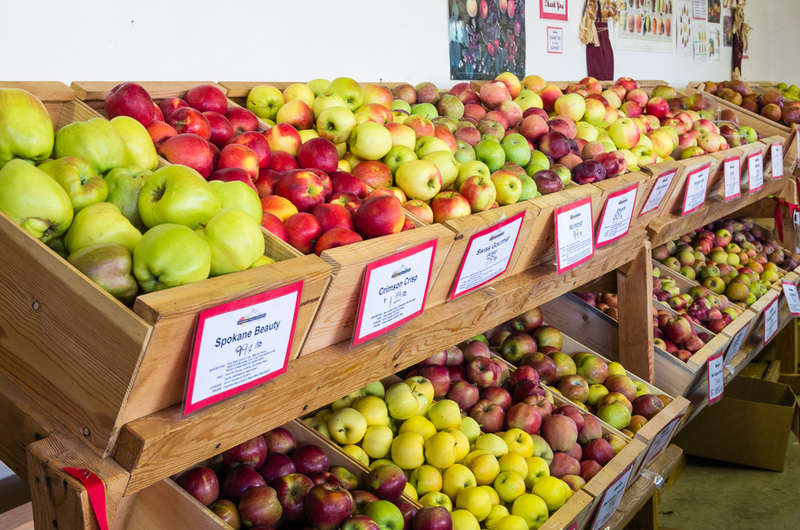 If you live in Oregon, Hood River is a great place to buy apples straight from the orchard. Kiyokawa Family Orchard is my favorite place to buy apples.